The Penguin appears to hold hostages at the Gotham zoo using. 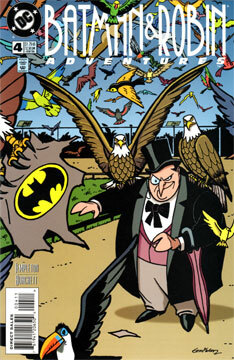 Batman sneaks in and is confronted by an army of birds. He’s led to the Penguin, where he learns Penguin is using Mad Hatter’s technology to control birds. His ultimate goal, Penguin says, is to free the birds back into their native habitats. Once Batman learns there are no real hostages, it’s a quick fight with birds and the Penguin, and then the criminal is sent back to jail. Templeton put down his pencils and switched to the keyboard for this outing. The story is solid, if simple. If my summary above seems brief, it’s because not much happens. There’s a lot of dialogue from Penguin, though. Fortunately, Templeton got the animated Penguin’s character down properly, or else all that talk might have been insufferable. I was a little confused by the references to “Seagate” prison. Um… It’s called “Stonegate” in the animated universe. Perhaps Seagate is a new annex. Burchett took over pencils and inks this time. I don’t feel he’s quite as strong a draftsman as Templton or Parobeck, but he’s still excellent. I rather liked his renderings of Penguin. “Birdcage” could have happened at anytime before “The New Batman Adventures.” I didn’t see anything contradictory (aside from Seagate, mentioned above). Not unless you really like birds. It’s not bad by any means, but hardly required reading.